This short story collection contains three previously published stories that are no longer available either in print or on-line. This first-in-a-series collection includes the stories of three women who feel compelled to discover who-done-it for different reasons. Feisty, determined, they will get their man or woman. Look for quirky characters and some twists. Warning Signs by award-winning author Jan Christensen is made up of three short stories that were previously published in print and online markets. This collection is a bit less than 19, 000 words and each story is a good one. Each story has a small intro, a brief explanation of how the story came about, and details on where the piece first appeared. The book opens with the longest story “Warning Signs.” Rhoda isn’t happy with her ex-husband Hank for a lot of reasons. For one thing he isn’t paying his child support for their daughter Tiffany. To draw attention to the problem, Rhoda had a bright idea to put up a few wanted posters with Hank’s picture prominently displayed along a local highway. He owes fourteen thousand in back child support and with Tiffany in kindergarten and other issues, Rhoda is desperate. Somebody put up a “For Sale” sign in her front yard and Rhoda is sure Hank did it. She decides to retaliate by placing “garage sale” signs in his new more expensive neighborhood so that Hank and his new wife Melanie can get a dose of their own medicine. It is going to be a busy Saturday for Hank and his wife and serves them right. The war takes a new turn that Sunday morning when she comes outside to find her ex dead beside her car with the apparent murder weapon, one of her old iron skillets, on the ground next to him. Rhoda takes the skillet, washes it, and puts it away where it belongs in her kitchen before calling 911. Rhoda soon learns she wasn’t the only one angry at Hank and possibly wanted him dead. 28 year old Connie is not divorced yet but the divorce is coming in “Overkill.” She is supposed to meet with her divorce attorney, Jerry, but one thing after another happens delaying her arrival at his office. When she finally does get there she finds him apparently dead at his desk. The murder weapon still embedded deep in his chest. Soon named as a suspect and arrested, Connie has no choice but to take help anywhere she can get it to clear her name. That includes her soon to be ex-husband Howard who has more on his mind then clearing her name. The final story titled “Quack” involves a kidnapping. Awhile back Josie defended a guy, Harley Summers, who shot up a local coffeehouse. Fortunately he didn’t hit anyone but he still ended up serving jail time. He is now out supposedly none too happy about having had to serve jail time. That makes him the obvious suspect when Josie disappears and her aunt Reba is told that the ransom is 50K. The police can’t be involved and fortunately Reba is not only also a lawyer, but a resourceful woman who has people she can trust. Coming in a bit less than 1900 words this small short story collection is a fun and fast read full of mystery and double dealing with the occasional flash of humor. These three stories feature women who can handle their business and deal with whatever comes their way. Feisty and independent, the heroines don’t wait to be rescued but take action on their own to get the job done. Violence is kept at a minimum in these three stories as are the body counts and descriptions of the death scenes. Instead, the focus in Warning Signs is more on the psychology of people and their relationships and how folks may interact in ways that are not revealed until the aftermath of a murder. 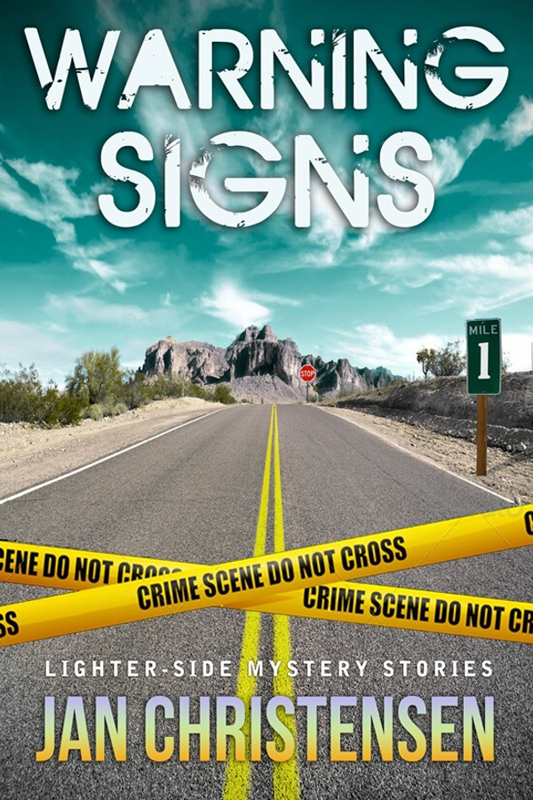 The award winning author has publicly stated Warning Signs is the first of a collection series with more around various themes planned in the future. This entry was posted in and tagged amateur sleuth, collection, humor, mystery, short story. Bookmark the permalink.